At our last homestead our garden was mostly a hillside. Simply out of necessity we terraced our hillside into permanent raised beds. We learned from that experience that there’s a lot more benefits than just flat ground that creating permeant beds can offer. This year, at our new homestead, we’ve come up with a new system of permanent beds and I love it! 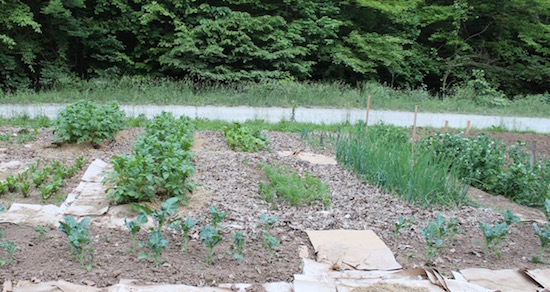 We designed and planted our garden using a simple 3’x10′ frame that Scott constructed from 2″x4″s. We chose a 3′ wide bed because even my short arms can easily reach the middle of the bed from either side. Also are largest garden rake is exactly 3′ wide and can be dragged down the bed. We stuck with 10′ simply because that was as large as seemed practical for the frame. Our frame, marking board, and large garden rake. 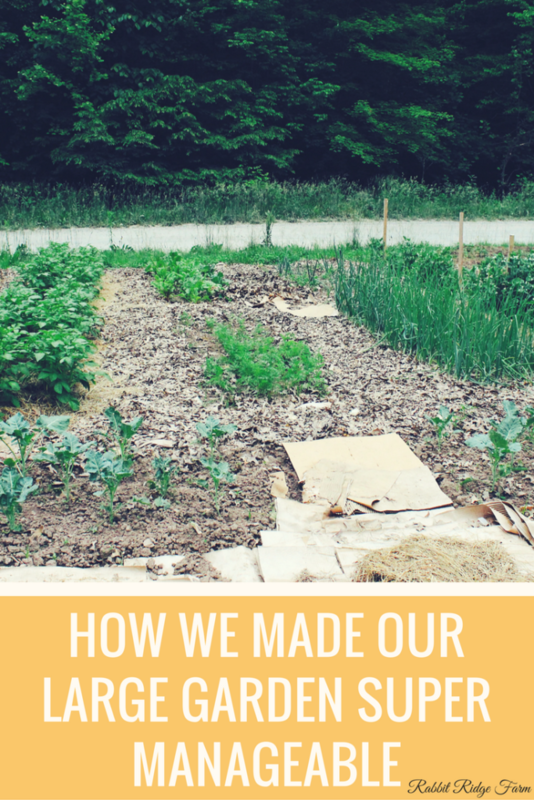 To prep a bed we simply laid the frame down and forked and raked the soil out inside of it. We kept a 2 foot path (large enough for our wheel barrow and to easily kneel in) between the beds on all sides. Scott also created a nifty little board we drag down the frame to mark our row spacing. While it’s not perfect for all of our plants we have used it a lot. 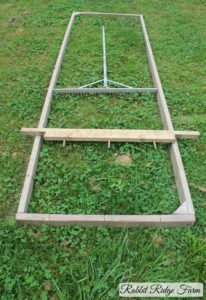 It marks three rows which has been perfect for crops like beets, carrots, lettuce, and chard. For larger crops like tomatoes we just use the two outer rows. 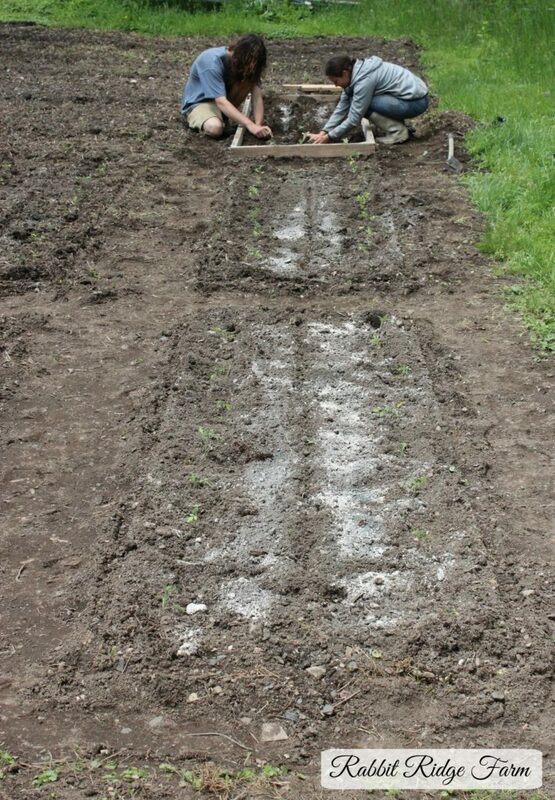 We also tried three rows of broccoli but offset the plants in each row so they had more room. So what about these beds has been so awesome? 1. Less compaction. If you’re constantly walking in your growing area every time you plant, weed, water, etc. you’re soil is going to become compacted. Compacted soil means not only is it harder for your plants to grow roots but it also means that the insects and microorganisms that would normally be present will also have a tough time. 2. Well organized. I can be a bit of neat freak so this is one of my favorite parts. 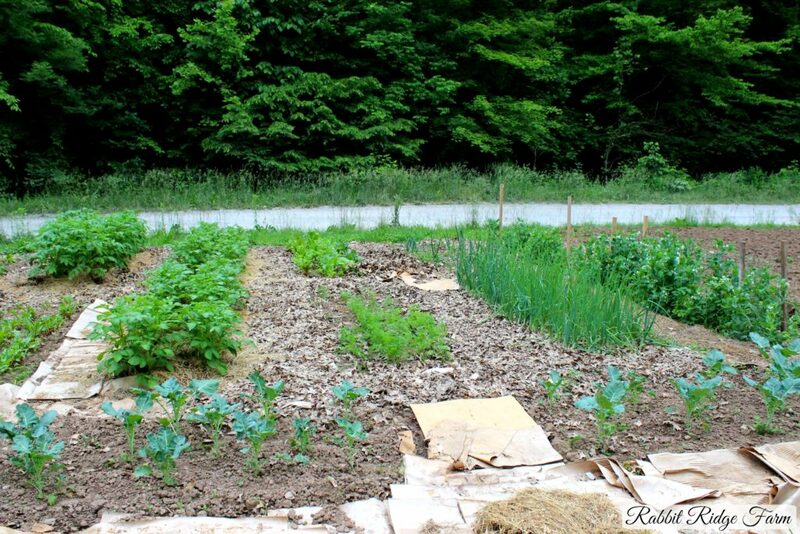 It was easy to plan the garden this spring and will be easy to organize crop rotations in the future. Pilgrim & Zak from Stone Axe Herbals. 3. Easy to plant and harvest. Having set spaces between beds on all for sides means we can easily access the all the plants and get a wheel barrow close to where we’re working. 4. Easy to weed. Our new system makes weeding easier in a couple of ways. First off small beds once again make reaching in to work easier. Secondly we keep all of our pathways mulched with cardboard and hay, leaves, or grass clippings eliminates the weeds in a large area. 5. Yields can be calculated by the square foot. Both as a farm trying to make a profit and a homestead trying to be self sufficient we’re really trying to keep good records. Being able to easy keep track of our yields is going to be awesome! 6. It’s easy to apply soil amendments. Many soil amendments are added per square foot so knowing the exact size of each bed is helpful. Ideally we’ll eventually also place permanent frames around the beds but this method is working just fine for now. As we clear more around our hilltop housesite we hope to use extra logs to create raised beds. Some of our crops like corn, wheat, and sunflowers will still be planted in rows. Beets, potatoes, broccoli, carrots, chard, onions, peas. Do you use permanent beds? How are yours set up?